"Hedwig and the Angry Inch is a rock musical with music and lyrics by Stephen Trask and a book by John Cameron Mitchell. 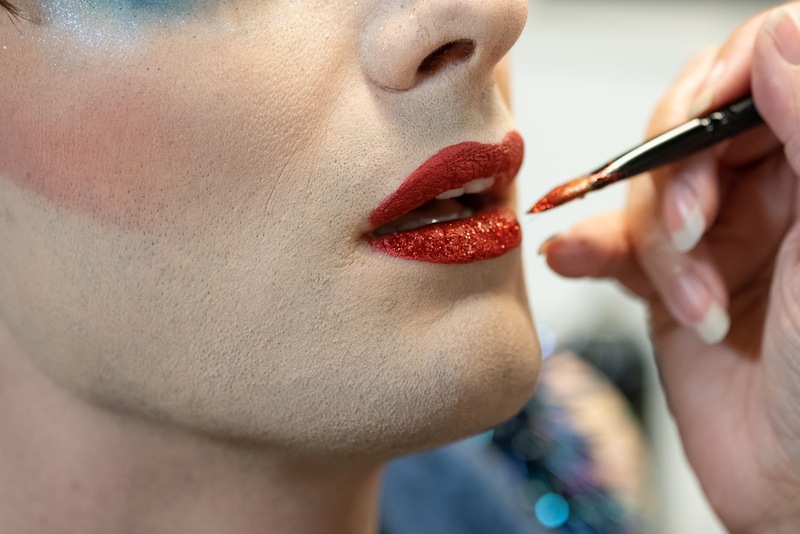 The musical follows Hedwig Robinson, a transgender East German singer of a fictional rock and roll band.... (From Wikipedia)...."
Our goal was to get video, for both social media and broadcast, as well as photography we could use in social media, postcards, web and print advertising and large posters. Because of various rules and scheduling we could only book time with our primary actor from 11:00 am to 3:30 pm. Our first priority was the video capture, with me sneaking in between takes and during location moves, and set-ups, to capture what we needed. Since the video crew was handling the overall lighting I was able to "borrow" their active photons and also use some of the location's existing light to take stills. I was depending on the X-H1 to grab good focus in a range of interior lighting situations, and with the historically maligned 60mm macro lens. The TL:DR is this: Nice, fast rig with the ability to nail focus in light low enough to call for 1/60th of second, f2.4, at ISO 3200. The files (raw) looked great and were very malleable in Lightroom. I worked entirely handheld since we were moving quickly between video set ups. Also, many of the shots were very close-in and working without a tripod allowed me to move into position quickly and get the magnifications I needed. (even though my usual preference is to bring a tripod...). So, let's start with the body. I'm using the X-H1 with the battery grip for a couple of reasons. First, I like the feel of it. When working with a camera all day long it's got to feel right in my hands and a good part of that is whether or not the camera is big enough to hold without weird hand contortions. The grip makes the body feel just right for production work. You might not feel the same way if you just want a camera to dangle over your shoulder all day long but if you have it in your hands for hours at a time the weight and size is a whole different equation. In this kind of set up it's no longer necessary or even helpful to have a small, discreet camera but a hefty production tool with really good control surfaces makes life easier. There's ample gripping space around which to wrap your hands. A more comfortable hold. Better access to buttons and controls. Second, I use the grip because this camera is famous for just chewing through batteries; especially if you use the "boost" setting. The boost setting speeds up all the camera processes and makes the camera feel responsive and quick. I want my camera to be responsive and quick so I use boost. But I also want my camera to be able to shoot all day long without having to stop time and again in order to change batteries and the boost setting delivers more battery juice to the camera. The grip gives me two more batteries in addition to the one in the body. All three of the batteries in the X-H1 and grip are the new 126S batteries that are said to have more gusto and endurance, and better thermal handling than their predecessors. One thing I love about the battery grip is that you can attach a charger directly to the grip and recharge the batteries while everything is still attached to the camera. I started my day downstairs in the theater's make up area, adjacent to the "green room." The video guys were upstairs hauling in (many, many) cases and getting all their stuff set up in the actor's dressing room (our primary shooting location). Everything I brought along fit into the Think Tank Airport Essentials backpack making me extremely efficient. 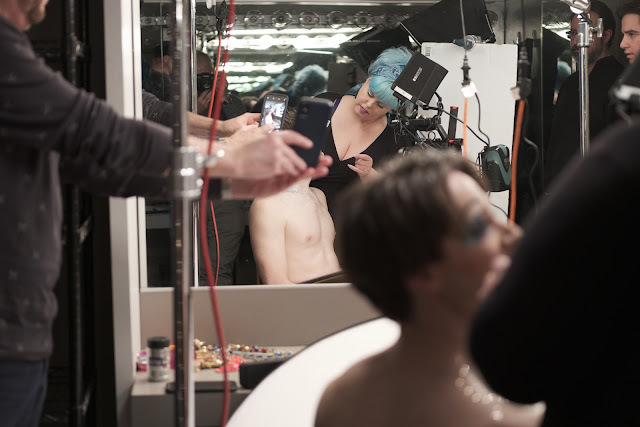 While the video crew was getting their feet wet in the space I found the actor and our theater's head of make up and started photographing the transformation process of actor-into-character. I'd wanted to try out the 60mm macro lens from Fuji since I purchased it a few weeks ago but have had few opportunities to play with it over the holidays. I had heard from various people that the 60mm, being one of the oldest lenses in the system, was slow to focus and could sometimes mis-focus entirely. Things change from initial introductions. 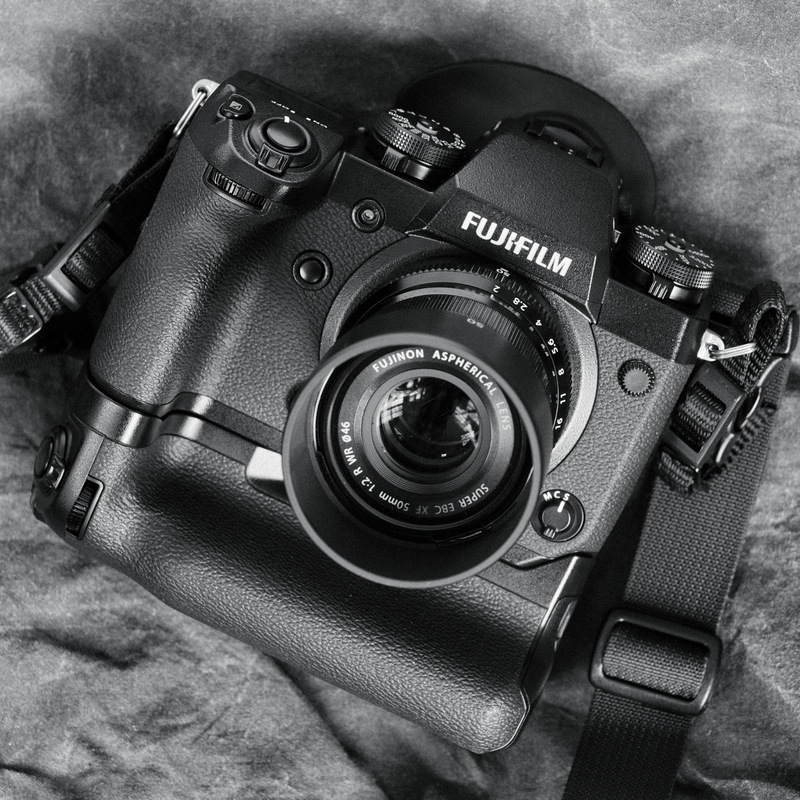 Newer bodies get better focusing hardware and, just as importantly, Fuji seems to keep making improvements via firmware which keeps making the products better and better performers. I made sure the camera body and the lens were both upgraded to their latest firmware before considering them for this (paid) shoot. My initial testing showed me that the macro lens was a bit slower to focus than one of my newer WR series Fuji lenses but that it was generally fast enough--- and always accurate. As I rarely shoot with continuous AF enabled, and mostly shoot under fairly controlled circumstances, I didn't really stress test the AF of the camera or the body. It's not that I am hesitant to do so but rather that I rarely shoot in that mode and wanted to use both pieces of gear in my usual way. I shot the 60mm lens mostly at f2.8 and was pleased to see that it was nicely sharp at that aperture; especially at the closer distances at which I was working. When I reviewed the files in post the next day I was happy to see that they were very detailed and very easy to make changes to. The cameras does perhaps the best job I have seen so far at having the images I saw in the EVF match the images I was seeing in Lightroom on my iMac screen upon import. That sure makes life easier. The battery grip on the camera body makes it a bigger and heavier package than I think most people would imagine if they have the prejudice that mirrorless should always mean, smaller and faster. The main advantage of the X-H1 body and grip is that they are very solidly made instruments. According to Fuji the camera uses a magnesium alloy shell that's 25% thicker than previous cameras like the XT-2. Going back and forth from my (smaller and lighter) X-T3 to the X-H1 you can feel that the later camera is denser, heavier and gives the impression of being more in the historic mode of the battle ready professional camera ilk than an enthusiast's tool. The same holds true for the battery grip. The camera and grip exude reliability and resilience. Another advantage of the bigger, denser camera package is my ability to better hold the camera steady. In combination with the X-H1's in body image stabilization I can generally hand hold a lens like the 60mm, with good results, down to about 1/4th to 1/8th of a second. Not quite the territory offered by the superior I.S. (and dual I.S.) of the Panasonic G9 but also nothing to sneeze at. Finally, the grip serves its actual purpose admirably by getting the through an entire day of still photography with ample charges left on two out of the three batteries in the little, closed eco-system. So, to start out, I was shooting using the theater's everyday work lights in the make up area; which are regular, long tube fluorescent fixtures. I hate to leave white balance to chance, even when I am shooting in raw format, so I did a custom WB when I first pulled out the camera. Fuji makes custom WB's easy as pie. Having a good, custom WB locked in keeps from having different color casts as you move your camera around the room, and change compositions, and even angles of view. While the auto white balance was very pleasing, usually, I knew that a singular WB for each location would make batching corrections in post processing that much easier. Good thing the X-H1 is easy to set for that! Also, there are three or four custom WB "slots" (presets) so you could make a custom WB in every scene ( up to four) in which you'll be shooting and then choose between them for correct color balance in the quick menu when you change locations. I mostly use single point AF and my shoot at Zach Theatre was no different. We were shooting lots of very tight shots; just an eye or just lips, so I'd set my composition and then use the joystick on the back of the camera to move the AF point until it was exactly where I wanted it. I found that staying in the center area, the area filled with PD-AF points got me almost immediate AF lock-in. Nice. 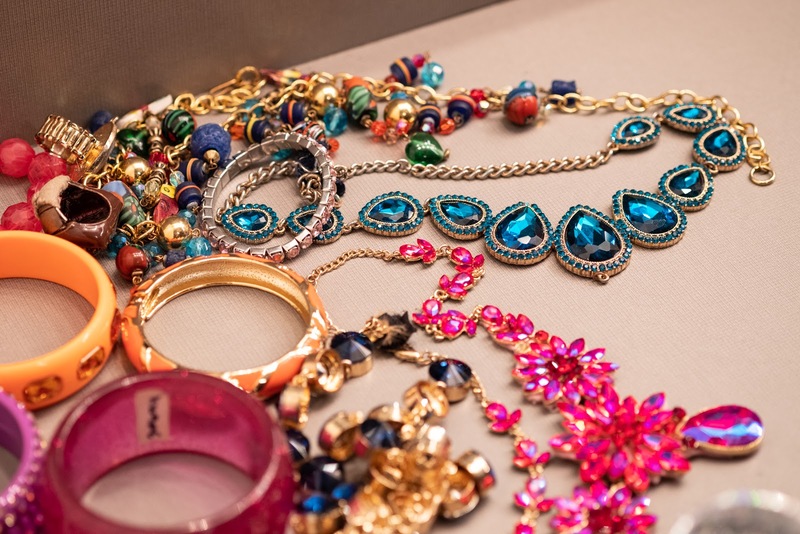 A grab shot of the jewelry props. Focusing on the blue necklace. Working with a video team is always a process that requires patience. When shooting stills I was the camera operator/director/creative director and producer. 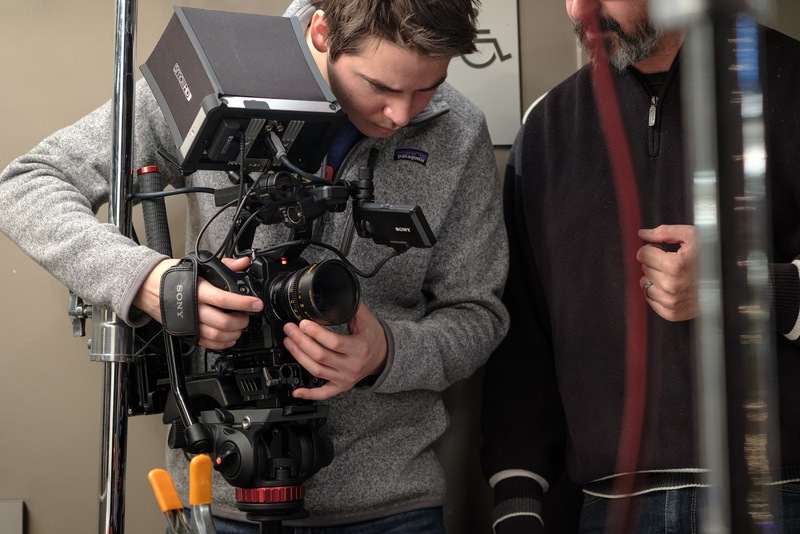 A film crew from an ad agency has a different person for each and every position as well as a representative from account service, and also a few ad agency interns. There's an approval chain to be respected as well. 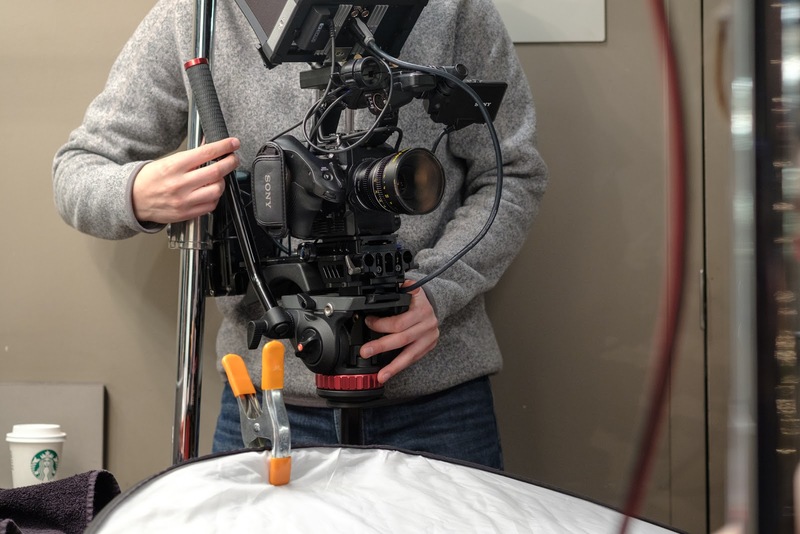 The result is that many times the camera operator will set up what he thinks is a good match for the image, based on the storyboard, and then the director will make his changes while looking at his monitor. Then the creative director will step in and pee on his corner of the approval process before the account service person then realizes that it would be smart (politically and bottom line-esque) to also include the client in the loop, which the requires the in-house marketing director to look and approve, who then solicits her team to come look and to give her feedback and suggestions. Talking about the 60mm macro f2.8 lens for a minute. I liked its small size and the way the lens rides on the front of the big camera. The lens hood is very long, well over-engineered, but as it reflects the most conservative aid against flare and non-image forming light I could only presume it does its job well and left it on all the time. Since none of my shots were ruined by flare or lowered contrast I was happy to always have the lens hood along for the ride. The added weight was negligible. I mentioned that I used the 60 macro lens mostly wide open (at f2.8 mostly) and it was sharp and had a nice, almost film days/nostalgic feel to it. I found that I needed to crank and crank the focusing ring to get the changes I might need when using manual focusing but the auto focus was more than acceptable. Most lenses would be easier to focus if the attached cameras were stabilizing them, and since the X-H1 is the first stabilized Fuji body it could be that the very good performance I was getting, when focusing with the 60mm, was due to the positive effects of the image stabilization. At any rate, with the equivalent angle of view of a 90mm lens on a full frame camera the 60mm on the Fuji was right in the middle of the sweet spot I'd been looking for in the APS-C format. Long enough to compress and also drop stuff out of focus in the background but not so tight as to remove all vestiges of background information from the resulting images. I like the lens I got and I intend to keep it. Back to the camera. I have to spend a sentence or two praising the camera's fantastic shutter. Even in fully mechanical mode it makes a Leica M series rangefinder camera shutter from the golden days sound like the banging of a metal trashcan lid. Remove the X-H1 a foot or two from your head and, in a normal room with conversations taking place, I can't imagine you'd ever hear the shutter. That's classy! And it meant I could shoot all day long without disturbing the flow of the video process. It meant calling less attention to me. One more plus for the X-H1 is the finder. The EVF finder. It's just great. Big and sharp and detailed. It makes reality, as seen through an optical viewfinder, look vague, uninteresting and amorphous. Once you look through the finder (EVF) on an X-H1, or a Panasonic GH5S or G9, I doubt you'll ever want to go back to the dark ages of (non-informative) optical viewfinders. None of this is meaningful without knowing about image quality. It's one thing to hold a camera comfortably and well, and to be able to view the image well, but the reason these beasts exist is to create images. In this regard I can say that the Jpeg and Raw images I've been getting out of the X-H1 and the X-T3 are, in their own way, every bit the equal of the files I've gotten from the best full frame DSLR and mirrorless cameras I've owned. There is only one operating function that threw me for the first five or ten times in the field since I've owned and started using the X-H1, and that is having to do with the shutter speed dial. If I'm shooting in manual mode and have both the aperture and shutter speed dials set to non-automatic settings I'll go to change the shutter speed in 1/3rd stop increments with my front or rear dial (depending on how I have my camera configured) and if I'm within the two thirds stop range on either side of the number set on the shutter speed ring the camera works just as ever other camera I've owned does. But beyond that range the shutter won't respond to the camera body dial (not the dedicated, mechanic SS dial) and appears frozen. I finally realized that I just needed to move the dedicated shutter speed dial to a greater or lesser value to get back into the zone. Full shutter speeds are set on the shutter speed dial while third stop increments are set with a (reconfigurable) dial that falls to the thumb or forefinger. Remember that eccentric part of the old dial aesthetic and operations and you'll happily pound through the universe of manual settings, forget it and you'll hit the magic wall of frustration. After that happens everything seems harder and more challenging. My favorite new discovery about the X-H1 (and by extension, the X-T3): The final thing I wanted to mention in regards to the X-H1 is something that came to me in post processing. I'd shot everything using the standard camera profile and in a raw format. When I pulled the files into Adobe Lightroom I wanted to experiment with all the different, available camera color profiles. I like Classic Chrome a lot of wide scenics but the profile I found myself using on hundreds of files, where skin tone quality and dynamic range were concerned, was the Eterna profile. I know it was included as a decent, low contrast, low saturation profile for videographers who wanted to deliver work straight out of camera (meaning pleasing) files but I found that profile to be a great starting point for anything I shot that had a person in it. Eterna is not for everything but it's a beautiful profile and one which makes everyone look better; whether you are photographing them for still images or capturing video. I'm pretty happy with the Fuji system. I have one or two more lenses to buy and I'll happily use it for a good portion of my photography work. I'm going to have to let go of a couple lesser bodies once my second X-H1 camera is delivered but I think I can live without the smaller bodies and shed few tears. With two identical cameras you can use a short zoom on one and a long zoom on a second camera and you'll likely have everything covered. Set the cameras to identical white balances and exposures and you'll find post production to be quicker and easier than ever before. Since I bought my first unit at a very advantageous used price and am buying the second one at a radically low new price I'll have only $2200 invested in two current (and mostly state of the art) cameras with battery grips and a total of six new batteries. For a person who would never want to be caught without an identical back up camera I think I found my perfect camera deal.. I will most probably divest some earlier (Fuji) purchases from my nascent days with Fuji in order to soften the blow. I can already see the X-E2 and X-E1 up for sale, along with some other bits and pieces, but for the moment all the Panasonic stuff is safe and protected. More to come as I know more about these miraculous, modern cameras. A quick, quick heads up. B&H and Amazon currently have the Fuji X-H1 and the battery grip (with two Fuji batteries) on sale for $1299. Go check. Limited time. It looks like the sales have subsided. The current price of $1299 isn now for "body only." Still worth considering but not quite the adrenaline pumper the price was when the battery grip was included..... (writes K.T. on Monday morning...). I spent a full day with the Fuji X-H1 on Thursday. Shot 1200+ shots with it. Loved looking at them in post. Imagine my surprise when Michael Johnston's blog had a note that the camera with the battery grip and the two batteries for the grip was on sale at B&H for $1299. That's amazingly cheap. I vacillated for an hour, finger hovering over the "buy" button. In the end good sense overcame fear and trepidation and I just went ahead and ordered one. If you want one check with B&H and Amazon (who subsequently price matched...). But if you decide you want one then consider going to Michael's blog and ordering it through his links. I don't do links to B&H. Never got set up to deal with it. MJ deserves it since he found it and alerted me. I'm loving my time with the Fujis. They work. Just got word. My second X-H1 is on the way! Now to clear out some inventory clutter to make way... Anybody need a barely used X-E3 (Bought new in October) or a used by nice condition X-E2? Drop me a line. Let's make a deal.